Little Printer is an “Internet of Things” device that you can actually own. It’s small enough to fit on a desk or kitchen counter, where it wirelessly connects to the internet. Users subscribe to publications of their liking using a web app (the BERG Cloud Remote), which the Little Printer then collates into timely mini-newspapers. It doesn’t get more “slow web” than that. I am currently making such a publication for Nestoria, containing daily updates about new and updated properties. At the time of writing, most Little Printers are still waiting to be unpacked. As a result, there actually isn’t a whole lot known about how they are being used or how one would use printed publication of property updates. What we do know is how people set up email alerts on Nestoria, so those have been taken as a starting point. Given the fact that it is being sold by a London design studio, taking into account the gimmick-factor and price point of Little Printer, it is also to be expected that most users are fairly tech savvy and design-minded. Whether they are looking for a house to rent or buy, or merely want to keep informed of the market around them, people like to get updates about new properties pushed to them. In the ideal case, getting those updates results in the user wanting to know more about a given property by going to the source. This is where things get interesting though, because Little Printer essentially aggregates publications, one of which is the Nestoria publication, which in itself is an aggregate of information from different property portals. Subscribing to publications, printing them, reading their contents, getting more results or details about a single property all happen on a different system, possibly using a different device to access them and very likely at a different time. 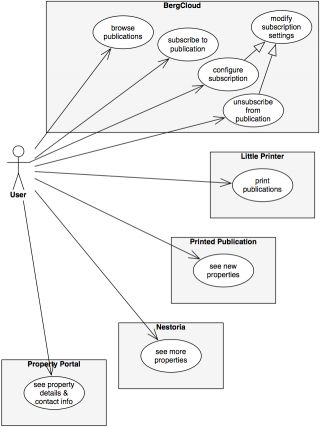 This means the different use cases are all very spread out, as in the diagram below. Subscribing to publications is done in the BERG Cloud web interface, so that’s where a user would go to configure their Nestoria updates. This presents a challenge: Nestoria’s updates only make sense if they are about properties that the user is actually interested in, which means the user needs to specify where to search and what to search for. Once that has been done, daily updates will automatically be delivered to the Little Printer, which notifies the user of with a blinking light. When the user is ready to read the latest news, he/she presses a button on the printer, which causes all pending updates to be printed. The paper Little Printer uses is tiny and the amount of available space is scarce, so the level of detail that can be printed is low. For more information, they will have to go to the web. The next challenge, therefore, is how to allow users to get from the paper preview, to either (1) more results for the same search on the Nestoria or (2) the details for a specific property on the property portal where it was found.